In Final Fantasy ix there is a minigame, which involves digging up items called chocographs. These are treasures located around the world and you have to find them with a chocobo. Go to the Chocobo's Forest and talk to Mene (the moogle), he will tell you that you can dig up the chocographs in the forest. Each game costs 60 gil, you get 1 minute to dig up what you can, there are many items in the forest besides chocographs. For every item you dig up you will recieve a certain amount of points, these points can be used to buy items from Mene. 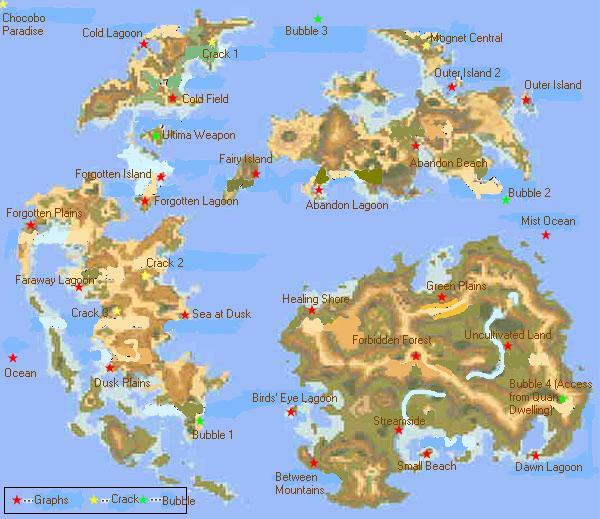 Above is a map showing all the locations of the chocographs, when the chocograph has been dug up look for the location on the map, and take the chocobo there. Some locations are only available as you progress through the game. Certain locations need abilities, this is the colour of the chocobo, there are certain treausres that give you the abilities. Also your chocobo can level up, he will do so every time you recive a lot of points from the chocobo game.Below is a list of the abilities and the chocographs. The chocobo air garden cant be seen, but it can be loacted by a shadow on the land or water. To get in the air garden you must have all the chcobo treasures found and opened except for three which you find in the air garden. Once you have found them all get your chcobo flying and fly (to get your chocobo flying go over a forest and press O) over the shadow, then use a dead pepper whilst still flying and you will be taken up into the garden where you can dig the remaining 3 treasures. Also in the air Garden is Ozma the hardest boss in FF IX, and he his in the little cave there, i dont recomend fighting him until at least level 85, or check the ozma guide. 1. By the River Forest Nomanira beach F 2 Elixers,3 Hi-potions,4 Ethers & 2 Germinas boots. 2. Between Mountains Forest Duhanda Beach F 5 Potions, 5 Hi-potions,2 tents, 2 cotton Robes. 3. Uncultivated Land Forest Zamo Howe F 10 Antidotes,1 Jade armlet, 3 wing edges, 1 cargoship card. 4. Healing shore Forest Easistan Coast F Blue Reef ability!!! 5. Abandoned Beach Forest Gekarchi Beach F 9 Pheonix Pinions,5 Pheonix downs,12 Peridots, Diamond gloves. 7. Forgotten Lagoon Reach Shallows F/R 8 gyshal greens, 5 ethers, 7 Hi-potions and 1 Dragon's claws. 8. Faraway lagoon Forest Shallows F/R 37 potions, 6 Magic Tags, 1 shield armour and 1 Gaia Gear. 10. Bird's eye Lagoon Forest shallows F/R 8 potions,4 pheonix downs,3 ethers and 1 magicians robe. 11. Small beach Forest Ranshake island F/R 4 remedies,2 elixers,8 rising suns and 1 Oak staff. 12. Dawn Lagoon Shallows Reach F/R Red mountain ability!!! 14. Green plains Forest Alezandria highland F/R/M Dark-Blue Ocean ability!!! 15. Dusk plains Reach Seaways Canyon F/R/M 12 pheonix downs,14 ores,1 kaiser knuckle and 1 Iron man card. 16. 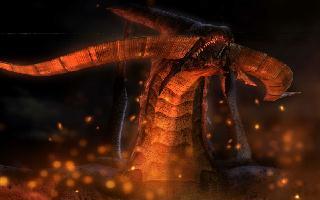 Forgotten Plains Forest Yuanshao highland F/R/M 17 ores,5 ethers,14 opal and 1 demons mail. 17. Sea at Dusk Reach Ocean F/R/M/S 15 pheonix pinions, 1 white robe,1 diamond and 1 Masamune card. 20. Mist Ocean Reach sea F/R/M/S Gold Flying ability!! !